Whitworth University will kick off Homecoming 2009 with a lecture by nationally renowned landscape painter Ben Frank Moss, a 1959 alumnus and the George Fredrick Jewett Professor of Studio Art at Dartmouth College, in New Hampshire. Moss's lecture, "Silent Sounds/Invisible Stillness: A Mystery Experienced," will take place on Thursday, Sept. 24, at 7 p.m. in Room 111 of Weyerhaeuser Hall at Whitworth University. Admission is free. For more information, please call (509) 777-3732. For a complete listing of Whitworth Homecoming events taking place Sept. 24-27, please visit www.whitworth.edu/homecoming. Moss has exhibited extensively throughout the U.S. for the past 30 years. 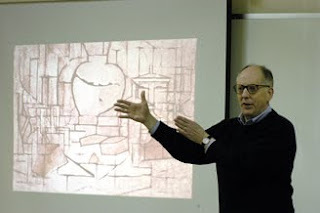 He has received numerous honors and awards, including membership in the National Academy of Design, Christians in the Visual Arts, the Ford Foundation Research and Travel Grant, and the Distinguished Alumni Award at Boston University, where he earned an M.F.A. in 1963. As a landscape painter, he seeks to establish a sense of "place" in his work. He observes light and space as shaped by time and season, and brings these observations to his work. In his small oil in paper paintings, he uses color, form and gesture to evoke memories of place. Homecoming will also include a recital by world-class soprano and Whitworth alumna Heather Steckler Parker, '96, and her husband, Derrick Parker, a respected baritone. The Parkers will perform selections from their repertoire on Thursday, Sept. 24, at 8 p.m. in the Music Recital Hall at Whitworth. Admission is free. For more information, please call (509) 777-3732. Steckler Parker made her New York opera debut at Alice Tully Hall as a winner of the 2002 Puccini Foundation Competition. She holds an M.M. from Eastman School of Music, and she has performed with opera companies all over the U.S.
Moss and Steckler Parker are two of four Whitworth alumni who, along with key university donors, will be recognized at the George F. Whitworth Honors Banquet on Friday, Sept. 25, at 5:45 p.m. in the Hixson Union Building. Moss will receive the Distinguished Alumnus Award for extraordinary service to the community and achievement in his field. Steckler Parker will receive the Recent Alumna Award, which recognizes alumni who have achieved significant success in their careers within 15 years of graduation. Also being honored are Kathie Koopmans Neir, '64, who will receive the Alumni Service to Whitworth Award for her significant support of the university, and Ben Lindstrom, '63, who will receive the Alumni Mind & Heart Award for exemplifying the Whitworth mission. · Open house for the new East Residence Hall, at 11 a.m.
· Whitworth Pirates Football vs. Chapman, at 1 p.m. in the Pine Bowl. Whitworth University, (509) 777-3730 or amcmurray@whitworth.edu.